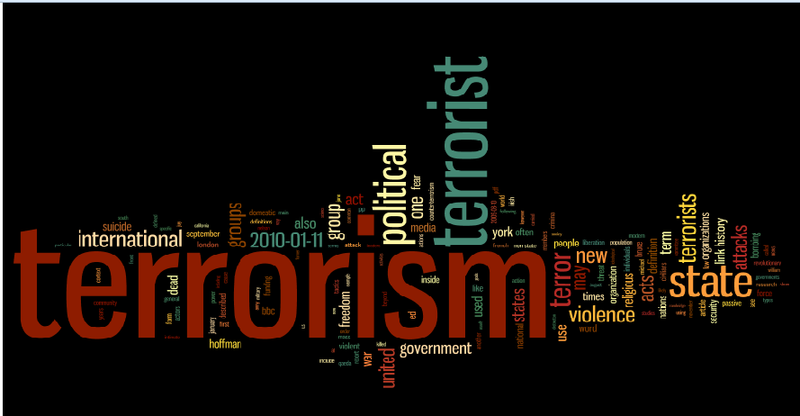 Terrorism is very high in the public’s consciousness and is frequently in the news. As a term, however, its usage is quite inconsistent and highly political, with it generally being used to describe violence we condemn, find immoral or believe is unjustified. Part of the problem is that it is not the violence in itself that makes something terrorism. After the Boston Marathon bombing, President Obama said, “any time bombs are used to target innocent civilians, it is an act of terror.” Of course this means that the nuclear bombs dropped on Hiroshima and Nagasaki, most of the other bombing in WWII and Vietnam, and many other actions by “legitimate” armies would be acts of terror as well. It is the motivation behind an act of violence that helps to define it as terrorism, and of course motives can be hard to determine. This leads to the position where one person’s “freedom fighter” is another person’s “terrorist.” For example the South African government labelled Nelson Mandala a terrorist. Most scholars agree that terrorism is a form of violence or threatened violence against a target to achieve a goal. It is meant to induce fear in an audience that is different from the target of the violence. Separating the victim and the target is one of the key features distinguishing terrorism from other forms of political violence like genocide… Some argue that the target of the violence has to be a civilian or a noncombatant, while others relax this restriction (p. 415). The use of violence or the threat of violence with the primary purpose of generating a psychological impact beyond the immediate victims or object of attack for a political motive (p. 230). In the current climate, at least in the West, terrorism is mainly used in response to actions by Muslims. There is no hesitation in calling the Charlie Hebdo murders or the Lindt Cafe siege terrorism, but there is greater hesitation giving the same label to the Unabomber (who was involved in a nationwide bombing campaign in the USA). If we look at the Wikipedia entry for The Unabomber (as at 16 January 2015), Ted Kaczynski, the man responsible for the bombings, is described as “an American mathematician and serial murderer” who “engaged in a nationwide bombing campaign against people involved with modern technology.” In the article of over 3600 words, terrorism is only mentioned twice: once when it described how Kaczynski promised to desist from terrorism and once when it stated that the FBI designated him as a domestic terrorist. If he had been a Middle Eastern Muslim, I suspect the language would have been quite different. We need to be careful about how we talk about terrorism. The following video looks at some of the problems with the way in which terrorism “experts” use the term and the political nature of its usage. Terrorism is a powerful and evocative word. Using it allows us to express our utter contempt for an act and demonstrates we believe there was no justification for killing or harming innocent people. We need to be careful, however, that we don’t use it in ways that marginalise or oppress other people, and that we don’t use it to justify responses which ignore the human rights and well-being of others. This entry was posted in Social change and tagged Definitions, political violence, Terrorism, Terrorists, Violence, What is. Bookmark the permalink. 1 Response to What is terrorism? Good post, especially the part about Kaczynski. It is very revealing to see how he is treated in the media for his act of terror.